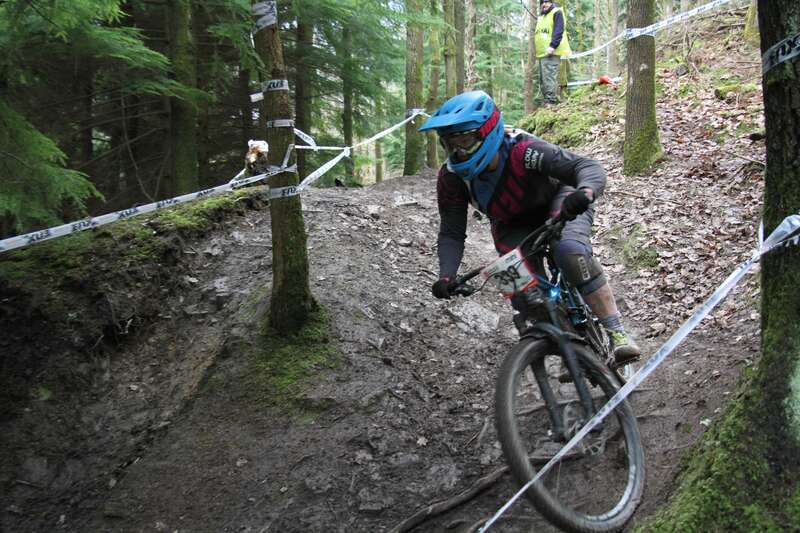 The Onza Mini Downhill in the Forest of Dean at the weekend was the first race of 2018. With a staggering 44 ladies entered and some ladies categories selling out weeks in advance I was expecting a fun race. I’ve been working hard over the winter to rebuild my strength and fitness after some big injuries last season that saw me off my bike for most of the year. With the support of the Physio Clinic I have become more structured in my training and I even started some actual gym work (!!) in November in a bid to be ready for the main race season kick off in Spring. I have also had to change my attitude to racing as I was asked to set out my race calendar and identify which ones were most important. This was a new concept for me; I always want to do well so the idea of having different aims for different races intrigued me. I quite liked the idea that some races would be for fun, some for testing set things (tactics, bike set up, preparation etc) and some would be where results mattered. My training had been based around this and it meant I could have fun at this first race. In the week of the race I reflected that although I was still unfit and overweight I had actually come a very long way. Sure I wasn’t race fit but I could now ride my bike all day, play a full netball match and lift weights that impressed the guys in the gym. Getting even more specific I could drive my car, put on my own socks and run up the stairs. These seem like small things but for a good few months they were out of my reach! This first race was to ease back in to racing, catch up with friends, meet new friends and enjoy riding my bike. I figured if I could have fun and remember why I liked racing it would be the perfect start to the year. I didn’t know the vast majority of ladies in my category but with 14 I said I wanted a top 8 finish. This didn’t seem too ambitious and felt reasonable for a fun race. The track was announced as flatlands into sheepskull and I learnt that flatlands had changed since I last rode it. I went out for a couple of hours race practise on Friday and had a great time hitting lines, meeting some new people and generally enjoying the warm afternoon. The only downside was that Edith, my enduro, was in the workshop and with an uphill section and long flat pedal in the middle of the track my downhill bike was testing my fitness. Saturday was not good race preparation as I did not practice at all but I did have loads of fun playing top of the division at netball! It was the hardest game of the season and I was black and blue by the end plus feeling pretty tired. However my spirits lifted when an awesome friend lent me his enduro for the race. He laughed and asked me not to break it stating zero confidence in me not crashing it which felt harsh given I’d not crashed at all on Friday! Feeling extremely grateful I set about destroying his carefully tweaked set up so it fit me. The weather had been pretty vile since Friday and as expected the track was wet and showing the changes that hundreds of people practising on it all day Saturday had caused. A few people exclaimed at my tyre choice but since it was borrowed I figured I bit of sliding could be fun. I felt confident from Friday and set off on my first practise run….straight into a tree! Ok it turns out my friend was right not to trust me to stay on the bike. Loads of people were crashing in the rooty section but I made it through on my line and went back to the top to try and find a way around that tree. I made it round the tree and hit all my other lines with only a small amount of trouble sliding round the corners. The next few practise runs gave me a closer relationship with that tree and then I also fell off in the roots section after slowing down for someone else who had crashed. Feeling pretty battered I went for another practise run slamming straight into my tree and then getting landed on by a huge guy who hit the same tree just behind me! I was having fun but I wasn’t feeling very on it haha! I met lots of cool ladies at the start line and had fun chatting. I barely felt my normal pre-race nerves and was looking forward to the first run. Predictably I hit the tree and had a horrid line through the roots bouncing all over the place and dropping on to the fire road sat on my saddle with my feet flailing around. Somehow I managed to stay on my bike and the lower half of the track was more successful. I crossed the line in 7th which was just inside my desired top 8. After gossip and snacks I went to watch some racing with my husband and dog hoping to find a safer slower line through the roots which would be faster overall if I could keep my momentum. I wouldn’t normally switch to a line for the race I had not ridden or at least walked in practice but it felt like the right choice. I could visualise the tree stump at the entrance to the line so figured I would give it a go. I also felt like I’d been rolling super slow all day which my husband confirmed. The track was reasonably flat so I decided I would try pedaling through the flatter sections to see if that made a difference. Queuing for my second run I was hopeful of a faster time and fewer incidents! I made it round the tree and hit my new line through the roots pedaling the whole way through. Then I hit the bottom of the track and where previously I had nailed my lines I found myself heading towards a different tree at a much higher speed! I pulled some shapes and glanced it with my rear, got out of shape on the next section and then calmed it all down. I pedaled more than the previous run and crossed the line 0.2 seconds faster and still in 7th place. Hmm not really worth the pedaling! Overall I had a great weekend. I learnt that I could go to a race for fun and feel genuinely happy with a lower result than I would normally want. However I also learnt that while I was happy with my position I wasn’t happy with my time, typical girl logic! It was the first race in a long time that I hadn’t been able to stick my lines and a very good reminder why I am normally very particular about tyre choice for racing, rookie error! All day I listened to people discuss the ladies field and the ‘explosion of ladies riding’. People wondered where did all the chicks come from and why do they always have champagne? Everyone seemed to think it was great to see such a big womens field and the whoops and cheers track side were endless. As I thought back to my first race where there were 8 women the sport seemed almost unrecognisable. I can’t wait to see where ladies riding goes next!